Before I talk about the episode proper, it feels necessary to clear up a few things regarding Game of Thrones as a series. So far the episodes have taken place, if not prior to, during the first few episodes of season 4. Before now nothing about the TV series has been spoilt in the games, however the events of episode 3 take place during the royal wedding, where things take a drastic turn during the TV series. So if you plan to watch the series, catch up now because the games have entered spoiler territory. What’s more I have watched up to the end of season 4, thanks to the region 2 DVD finally showing up here in the UK, and the games follow to the end of the Season so things might get very interesting on the Gared front. But we’ll cover that later. Also I’ve taken to playing the games on the Xbox One as opposed to the mac book like with the previous episodes, and I feel a lot better for it. Sorry PC master race, but its controller and bean-bag chair for me. I find myself making a lot less accidental decisions as a result. So, lets get to Episode 3! The first few episodes felt like they were setting up things, which are thankfully followed up with here in episode 3. First is Rodrick at Ironwrath, and my god have things gotten bleak. Gryff Whitehill arrives to lead the soldiers placed in your camp and gets to work in torturing you. It takes a lot of restraint not to act out; from mocking Ethan’s death back in episode 1, to provoking you every second you’re following this character, it made me dread every time the game returned to Ironwrath. To this end I feel like the story succeeded with what it set out to do, and makes you feel the desperation that the Foresters are going through, really nailing home how important the other characters actions are. Mira’s story takes a lot of turns, namely revolving around the events of the Royal wedding, which I will try not to spoil. Before now dealings with the other handmaiden Sara seemed rather pointless, but they are finally coming to a head and my loyalty to her seems to be coming into play. However my attempts to stay loyal to Margaery however feel somewhat futile. Seriously, what is this woman’s problem? It’s not over yet, so hopefully my actions in the previous chapters will help pay-off. Mira does have more action involved this time around, and there is more business talk which I appreciate over trying to win people’s favour. Asher’s story kicks off the episode with plenty of action and a tough choice early on, which sets the tone and gets things going right, though my decision was based on logic but I think Malcolm took it personally. There is little of him after the beginning until the end, which includes a really tense section, as well as a moment that genuinely made me laugh out loud. 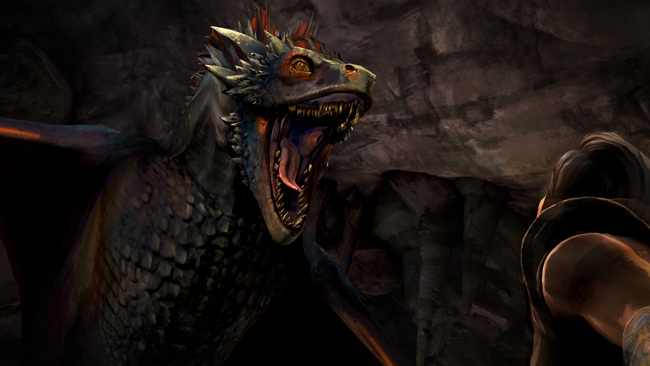 Though fans of the series will be happy to hear that Daenerys Targaryen makes an appearance at the end, and worried to hear that she is not in the best of moods with your character. Finally we come to Gared. In episode 2 his story felt like the weakest, but things are finally coming together, with secret alliances and a lot of restraint on my part to keep my vows. Speaking of which, this was one of the strangest parts of the episode. 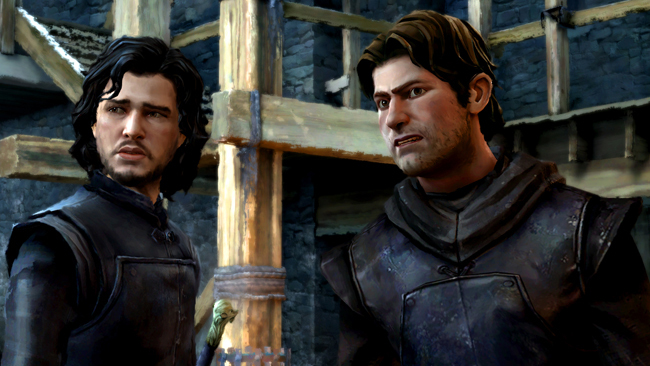 Right at the beginning Gared is taking his vows to the nights watch, honour bounding him to protect the wall, which is putting him at odds with his uncle and risks jeopardizing the safety of house Forrester. With that said the preview for the next episode makes me question whether these efforts were all for nothing, as the choice seems to be made for you where your loyalty lies. Hopefully I’m wrong and I can still face that conflict, though I am secretly happy that I may not have to choose. It’s a conflicted feeling, and maybe that was the point. So in conclusion, every part of this episode worked in my opinion. Rodrick, Mira and Gared have a lot of tough choices and puts you into a certain mindset. Gared was actually my favourite this time around; I’ve always chosen the good and honourable path in games, or at least try to, and Gared story is shaping up to feel very knight like in that regard. Asher has the least time devoted to him, though his action scene at the very beginning sets the tone that the rest of the episode follows. There’s a lot more action and involvement this time around. It’s like Episode 1 and 2 were the set up and this is where things start to play out. Your choices come back to affect you and you start to draw up an idea of how your characters appear to the others in the story. If you felt like the first episodes were a slow start, this will definitely keep you satisfied that events are moving forward. Gameplay wise I noticed less errors this time around. Last time the preview sections at the end seemed kind of jittery, which I attributed to my poor laptop performance at first but as it turns out was in the Xbox One version too. However it seems to have been fixed now, so the episode ran smoothly for me. 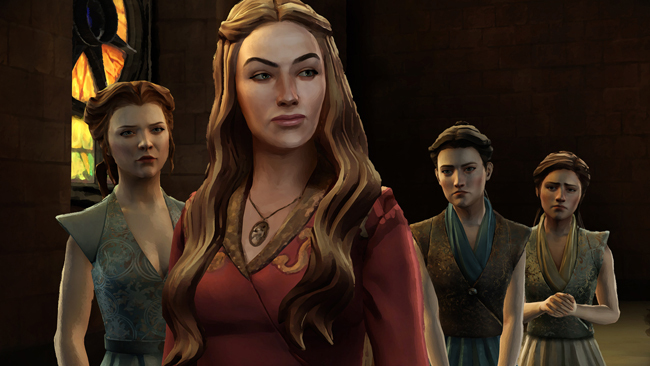 This entry was posted in Uncategorized and tagged Episode 3, Game of Thrones, TellTale Games. Bookmark the permalink.